The protection of American heritage resources has been a vital function of the United States’ government and law since president Theodore Roosevelt signed the Antiquities Act of 1906. Since then, many additional laws protecting America’s archeological, architectural, and historic treasures have been enacted, including the National Historic Preservation Act of 1966, the Abandoned Shipwrecks Act, and the Native American Graves Protection and Repatriation Act. These acts have created the necessity for specialty firms to survey locations that are about to undergo changes due to construction or that have undergone changes due to natural disasters. With an eye towards historic preservation, these firms use the techniques and tools of the surveyor in order to complete their work. The 30-year-old firm R. Christopher Goodwin & Associates, Inc. specializes in surveying for and the protection of American heritage resources. Headquartered in New Orleans with five additional offices around the United States, the Goodwin team is comprised of about 150 professionals, primarily archaeologists, historians, and architectural historians specializing in prehistoric and historic, nautical, and architectural work. In addition to documenting heritage resources with specialized methods, the company applies a suite of conventional surveying tools and techniques in its daily operations, including data collectors, total stations, hydrographic survey instrumentation, geographic information systems (GIS), global navigation satellite systems (GNSS), and computer-aided design (CAD) systems. They make routine use of aerial photography, digital elevation and surface and terrain models, and even spaceborne multispectral, hyperspectral, and radar imagery. Working 50,000 acres in the Chihuahuan desert of southern New Mexico presents many challenges. Elevations range from 4,300 to 4,700 feet, and the terrain is covered with shrubby mesquite, low-growing creosote, soaptree yucca, and various cacti. The scorching summer temperatures range upwards of 105 degrees, making dehydration, heat stroke, and heat exhaustion an everyday threat on any sort of survey in the hot and arid conditions. 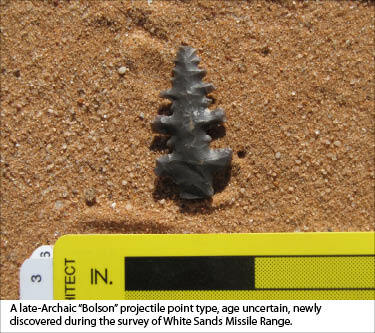 The assignment from the U.S. Army Environmental Command and White Sands Missile Range (WSMR), the largest Army installation in the United States, was to survey, locate, and document all archeological sites in this 50,000-acre area. Adding to the challenge was the fact that this part of New Mexico has the second-highest density of archeological sites in the state after Chaco Canyon; it contains literally 10,000 years of prehistoric occupations and 500 years of historic sites. The Goodwin firm performed this job in 2009 to 2010. To respond to project requirements, the firm developed customized, highly automated, comprehensive, and accurate survey methods. Ultimately, these methods relied heavily on GPS-based data acquisition for rapid integration into GIS coverage for this vast expanse of desert. Using Trimble receivers, data acquisition relied on a very complex data dictionary designed to capture information ranging from single artifacts (“isolates”) to large multi-acre prehistoric sites. Numerous iterations tested at the beginning of the project resulted in refinement of a comprehensive data dictionary, containing hundreds of discrete categories of data representing this large area and its incredible diversity of archeological sites. In addition to recording precise geospatial data typically collected by surveyors, the archeologists recorded environmental parameters such as soils, landforms, and vegetation as part of the record of archeological finds. All of these data then become part of GIS layers used by the installation. With GPS receivers loaded with military-grade, 1-meter digital orthophoto quads and pre-plotted 15-meter grids, 30 archeologists from the Goodwin firm began the systematic survey of 50,000 acres at White Sands in 2009. When they encountered archeological sites, they used the customized data dictionaries to inventory all surface remains, including all artifacts, thermal features (such as fire-cracked rock concentrations indicative of prehistoric fire pits or hearths), and prehistoric activity areas (such as stone-tool manufacturing areas). Some sites extended over 40 acres and took upwards of a week to record completely. The Goodwin firm’s archeologists downloaded data nightly into the GIS and created shape files and New Mexico site forms. With specialists on shifts working in the computer lab 24 hours a day, all of the next day’s survey areas, transects, starting points, etc. were pre-programmed in the GPS units before the crews headed for the field at 6 am. A rigorous quality-assurance review each night identified any data gaps for resolution first thing the next morning. The data were subject to an archaeological analysis to reveal information regarding the age, artifacts, and internal spatial patterning of activity areas, which illustrated specific prehistoric behaviors within each site. When the field survey was completed, the group of archeological surveyors had recorded more than 54,000 isolated artifacts and 476 full-blown archeological sites. By relying on integrated GPS-based survey solutions with results directly downloadable into the project GIS and analytical databases, this massive survey project was completed on an aggressive schedule. When Hurricane Katrina hit the Gulf Coast on August 29, 2005, Goodwin’s corporate headquarters in New Orleans literally went underwater. The firm’s executives met via telephone and decided to keep the entire staff employed, transferring their management group to other offices, moving their financial operations’ group to temporary headquarters provided by Alcorn A&M University in Mississippi, and moving its field teams around the country. In doing so, the firm became one of the largest New Orleans-based employers to make it through the storm without a single layoff. A little over a month later when residents of the city were allowed to return, Goodwin’s architectural survey teams were back to work for the U.S. Army Corps of Engineers (USACE), New Orleans District, and for FEMA. Their job was to survey over 20,000 historic buildings damaged by the hurricane and to document those buildings that had been destroyed or that required demolition in the Crescent City. For the past five and a half years, that team has been helping to rebuild New Orleans and the Gulf Coast. However, that is just part of the company’s involvement in surveying a post-Katrina New Orleans. As part of the Federal response to the devastation, the USACE issued Determinations of Imminent Threats of Flooding Due to Damaged Hurricane Protection Works. The race was on to improve flood protection, and the USACE immediately began to assess alternative actions and to plan for the construction of control structures, flood walls, and levees to reduce the threats to the New Orleans Metropolitan area by hurricane-induced storm surge, waves, and rainfall. Project plans for flood protection involved much of the southern shore of Lake Pontchartrain, extending well beyond the areas that had breached during Hurricane Katrina. The nautical archeological division at the Goodwin firm was tasked with near-shore marine survey along 38 miles of the Lake Pontchartrain and Lake Borgne coastlines. Using two differential GPS to direct navigation and to record the positions of all targets, the nautical archeologists used a cesium vapor marine magnetometer, a digital side-scan sonar system, and a digital sub-bottom profiler to examine the bottom of the lake. The assignment was to identify historic shipwrecks that could be damaged or destroyed during construction and to help the New Orleans District develop avoidance protocols so that no important American heritage resources were lost. For six weeks, the nautical archeologists collected data and reviewed it in real time on their computers while surveying 760 linear miles of track lines. They documented 1,993 magnetic anomalies and 104 acoustic side-scan sonar anomalies. The remote sensing instruments recorded areas containing debris, cable and pipe segments, disarticulated piers and bulkheads, and active pipelines, all of which could prove hazardous to construction. However, it was the acoustic side-scan sonar images that provided the biggest surprise. While Hurricane Katrina deposited many tons of debris from the land into the lake, it also scoured sediments from on top of a series of shipwrecks that had been buried for more than a century, allowing them to be viewed in near-photographic-quality sonar images. These historic vessels ranged from sail-powered merchant vessels such as late 19th-century V-bottom gulf scow schooners to a 19th-century sternwheel steamer and an early 20th-century workboat. Of particular interest was the discovery of only the second example ever documented of a vernacular French Louisiana sailing vessel known in Creole French as a bateau pointu a deux bouts, or pointu: a two-pointed sail boat. Historical research revealed that this form of vessel was last built on Bayou St. John back in the 1870s. The work that the Goodwin firm performs shows an interesting crossover. It uses the tools and techniques of surveying to help look back into the annals of history and prehistory. Their work surveying and protecting American heritage resources has taken the firm’s professional staff to 49 states, Puerto Rico, the Virgin Islands, and American Trust Territories in the Pacific. They have worked on almost 250 military installations, conducted nationwide studies for the Army, Navy, and Air Force, and even written the Army’s Guidelines for Native American Consultation. They surveyed the routes of the longest interstate natural gas pipelines built east of the Mississippi in forty years and the longest pipeline ever built across the Gulf of Mexico for archeological sites, cemeteries, or shipwrecks. Their modern surveying tools and time-tested surveying skills have been integral throughout.